Even small, hairline cracks in the concrete of a balcony can be problematic in the cold weather of the northeast. All cracks, no matter the size, will allow water to penetrate the concrete. As the temperature drops, the water freezes, the ice expands, which creates more cracks. These new cracks then allow more water to enter and further continue the cycle of deterioration. In cases of widespread, long-lasting water penetration, little white stalactites will form on the underside of the balcony. These stalactites are a sign of water migrating through the concrete slab and drawing out the calcareous materials used in concrete. During the winter, icicles hanging from the bottom of a balcony are also an indicator of water penetration. This water penetration can also affect the steel reinforcement frame of the balcony, causing it to rust and often leading to concrete spalling. The most common place for deterioration to begin is at the connection detail, where the railings of the balcony are embedded into the concrete frame. If this area was not originally caulked properly, or if the caulking has deteriorated, water penetration will occur. This water penetration can cause the metal to rust. As rust accumulates, it pushes against the surrounding concrete, resulting in the railings becoming loose. Not only are these railings a building violation, but they are also an extreme safety hazard. Leaning on a rusted and loose raining could result in tragedy should the railing fail. 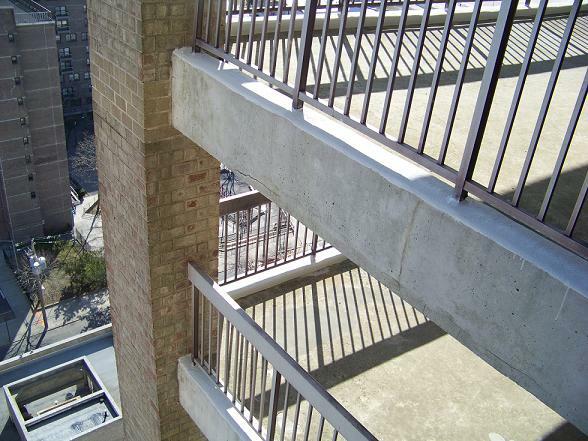 Depending on the gravity of the damage, a railing may need to be completely replaced. When balcony railings are replaced, it is important that the defective concrete surrounding the post is also removed and replaced. Balcony repairs often begin by repairing the concrete. Often the first step is for a contractor to take investigative probes of the defective concrete to determine underlying conditions. It’s important to remember that even a minor problem can escalate into a major issue if not addressed. Each day a balcony is not repaired is another day that the concrete is allowed to further deteriorate. However, spot repairs such as patching or caulking, are only temporary balcony repairs, and may not address all the underlying conditions. If you have the concrete of your balcony repaired, and then experience water ponding, it may be indicative of an improper pitch of the balcony concrete toward the drain. In these instances, the contractor will need to repitch the balcony concrete so that the water runs toward the drain. 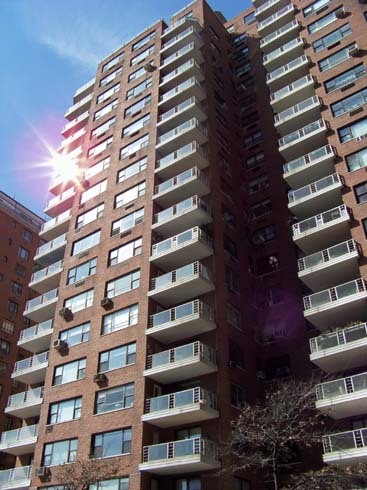 Balcony repairs in New York City can include concrete repairs, deck coatings, caulk replacement, permit costs, and the repair of the adjacent brick areas. Balcony repairs are typically expensive, noisy, dusty, and inconvenient for shareholders. And- like with dental work- most people don’t take the steps they need to take, until they must. However, preventative maintenance can go a long way in minimizing the need for repairs. The simplest and most important step is regular inspections. A yearly or bi-yearly inspection of the balcony by a contractor or engineer can give you an in-depth understanding of your balcony, but it is costly. If this form of maintenance seems unrealistic or out of your building’s budget, at least instruct the superintendant of the building, or the individual shareholders, to periodically check the balconies for necessary repairs. Look for cracks in the concrete, signs of rusting, discoloration on the roof or the floor, check caulking for deterioration, make sure drains are free of debris, and always be conscientious of the sturdiness of railings. Also, remember to never drag furniture or other heavy objects across the balcony, as this could damage the waterproof coating system currently in place on the concrete. Most importantly, remember that balconies in need of repair are not merely a nuisance to shareholders, but also a liability that could endanger the safety of the general public. And if someone does incur an injury because of improperly maintained balconies, it would be a serious liability for the building association. If you would like to have your balcony checked for repairs, please call Bellet Construction at 212-982-3000.